For those who aren’t familiar with the mountains of North Carolina, Asheville sits in a bowl about 2000 feet up. In recent years it has become a prime tourist destination and, because of its physical beauty, weather and amenities, a fast-growing metropolitan area. 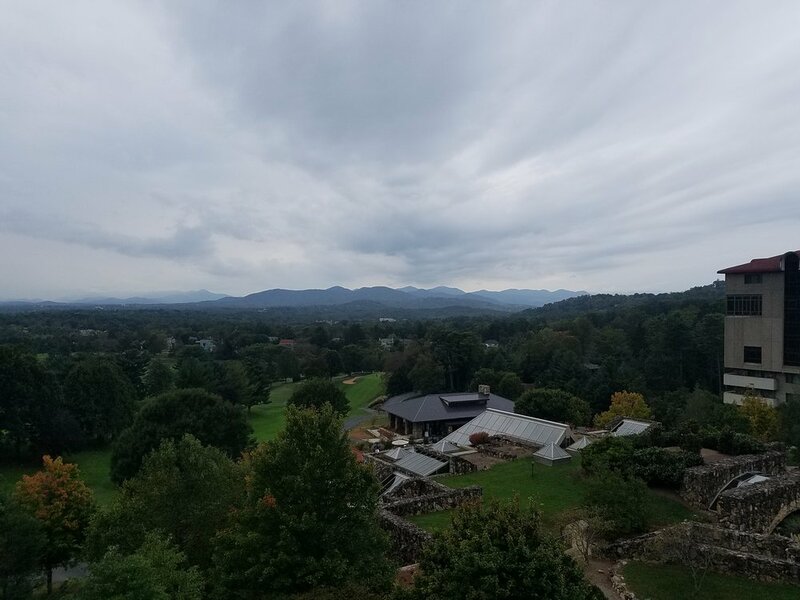 For visitors, the big attractions are the Biltmore House, one of the most active craft brewing scenes in the US, Thomas Wolfe’s home, many fine restaurants and, of course, the multitude of outdoor activities. There are many great things about living in Charleston, SC, so much to see and do but its location also makes it a great place to call home base with a number of great places to visit close by. Asheville is one of the places that is an easy get-away from here. In less than 5 hours you can be immersed in the mountains. That is what we decided to do as soon as my swim lessons slowed down. Heading up Interstate 26 we made a stop for lunch in Greenville. We had heard so many great things about Greenville and how it had changed and the cool places to stop and have lunch along and around its river park area. We parked and found a cute little bistro called Passerelle’s. It had indoor and outdoor seating with a lovely view of the Riverwalk and falls. It was the perfect spot for a quick lunch with a nice selections of salads, soups and sandwiches. After a short walk around the park we were ready to continue our drive to Asheville. 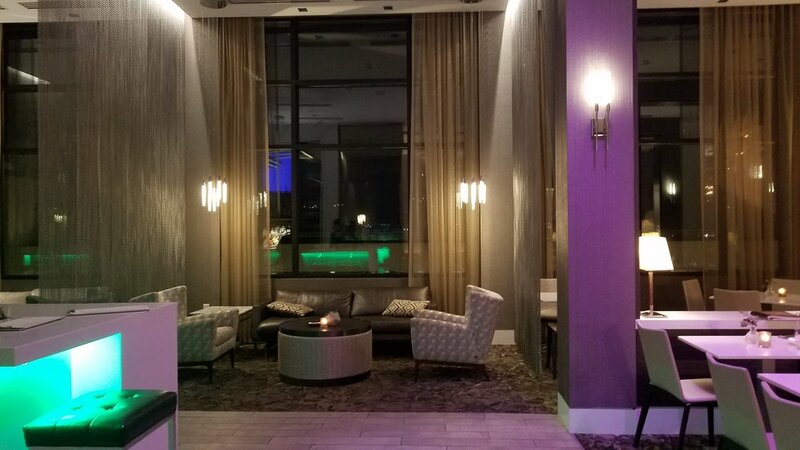 We had made reservations at the Downtown Inn, not known for is beauty or style, but the location was great and the price was right. It was within walking distance of everything. The rooms were clean but it definitely showed its age, though it did include a decent help-yourself breakfast in the morning. 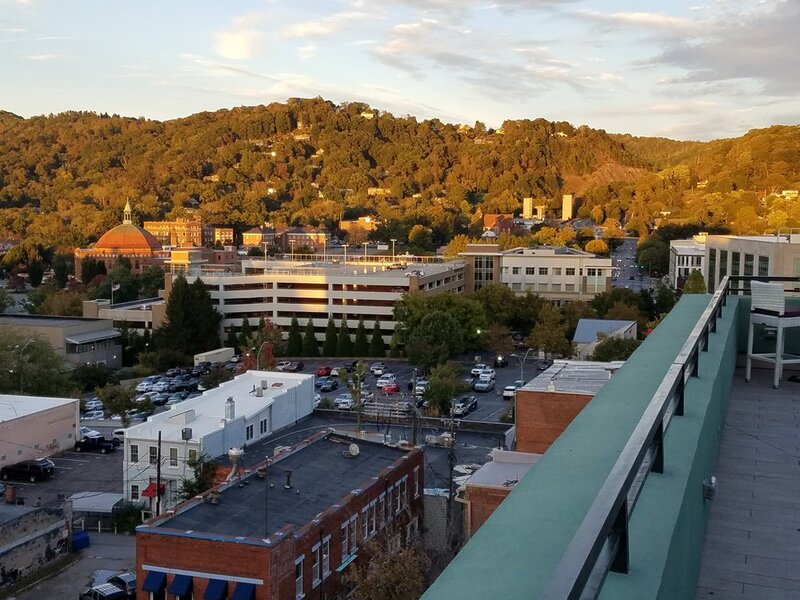 We were fortunate enough to have a room on the 5th floor, which had some very nice views of downtown Asheville and the surrounding mountains. After getting checked in we decided to stretch our legs and get a lay of the land. Wandering around Asheville you are always close to a pub or brewery, so our first stop was Asheville Club for a refreshing beer. With windows wide open it was a great little place to sit, sip a cold draft craft beer and watch the world walk by. Still somewhat full from lunch, we decided to dine on Dim Sum and Tapas. The Red Ginger on Patton street fit the bill just right. We chose to sit outside and our waitress, Megan, was wonderful, and her suggestions were spot on. The biggest surprise were the string beans. I have never tasted green beans quite so good, and who would have thought that a string bean could be the vessel of such crisp exploding flavor. We also enjoyed a number of other delightful treats: egg rolls, fried rice, beef ribs, tempura shrimp and sweet potato, Gua Boa - pork belly pancakes, and amazing steamed Szechwan won tons with pork and shrimp and chicken lettuce wraps. We wrapped up the evening with fried red bean ice cream and some amazing chocolate dish. When the bill came we were also pleasantly surprised at how such a feast along with drinks could be so reasonable. We would highly recommend The Red Ginger and Megan to anyone visiting Asheville. Stuffed and tired, we headed back to our rooms, ready to explore more after a good nights sleep. Our first full day started with breakfast at the hotel and the On and Off Trolley. As hokey as it may seem, these kitschy tourist bosses are often the best and most practical way to get a real over view of new places. 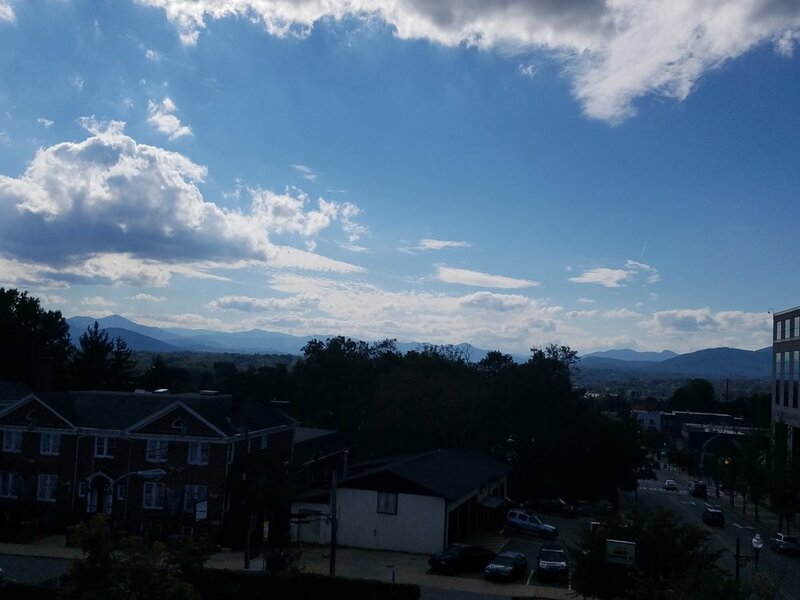 Asheville is too spread out to walk so this is a perfect way to see the sights and get an idea of where you want to spend more time. Our first stop was the Artist area along the river. 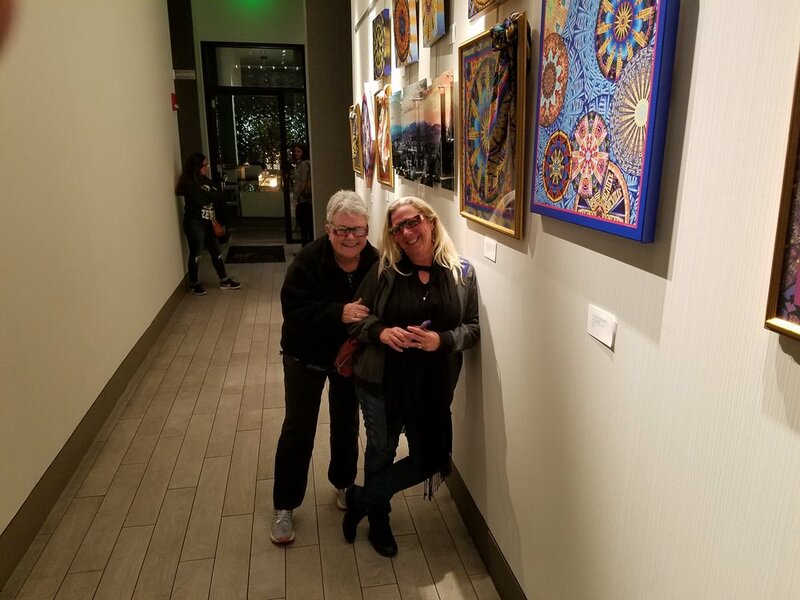 We hopped off and were immediately drawn into the art gallery of Jonas Gerard. The colors, textures, and invitation to touch all the work made it impossible for this ADHD person to resist. The first thing you notice about his artwork is that it pleases all the senses. I am not usually one to like abstract art, but this is abstract on steroids. There were pieces that we would look at and marvel at what each person saw in it. It really spoke to who you were. We were fortunate to be there while Jonas was working on a piece in his studio, so we were able to get a glimpse at the artist in motion. Sally and Rich are now proud owners of a Jonas original. Back on the trolley we headed to Biltmore Village where we hopped off, spent a little time browsing the shops and headed to the old train station for lunch. I will say that the shops in Biltmore Village were a little disappointing, as they were more commercial than I would have liked. But lunch at the train station did not disappoint: a nice selection of soups, sandwiches and salads and a homemade Bloody Mary that rivaled any I have ever concocted won me over! Back on the trolley and off to the Grove Park Inn. That is the place that WOWED me the most. You cannot look at it and not be awed. It was built in less than one year and the entire original structure is done by using locally harvested uncut granite from Sunset Mountain. The inn was built in five sections in terraced steps in the side of the mountain. No picture can do justice to this building you need to see it up close and walk through the doors, stand beside the bigger than life fireplaces and look out at the vast and breathtaking vistas. Back to downtown Asheville and little shopping in the local stores and galleries. 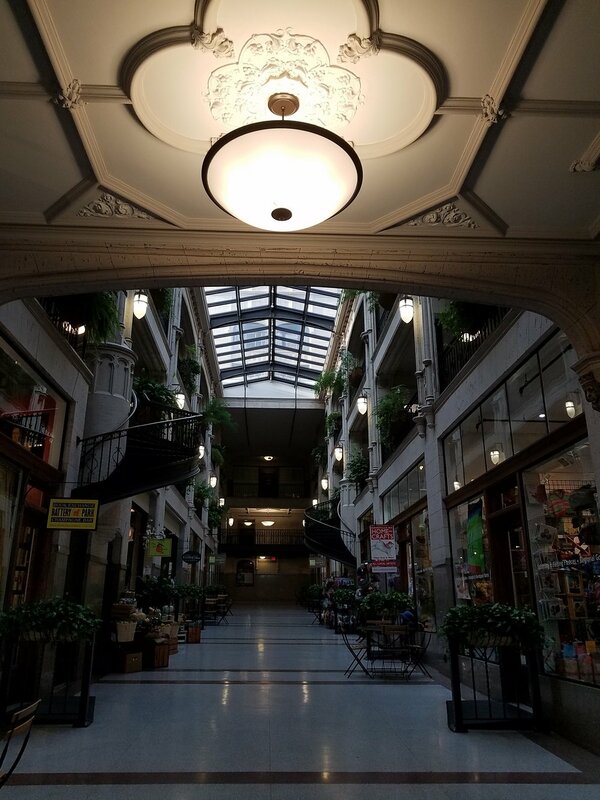 The old Woolworth is well worth the visit with numerous artists stalls and the original soda fountain still in use. The rain started but it wasn’t too heavy to stop us, so with umbrellas in hand, off we went to visit a couple of breweries - High Wire and Wicked Weed. High Wire was an interesting place with the brewery right there next to the bar. They don’t offer food but have an interesting mix of craft beers on draft. Wicked Weed has a very lively food and drink business. Upstairs was loud, crowded and hopping so we opted to go downstairs, which opens up to the outside but has great indoor and outdoors spaces with covering to protect you from the rain. It is extremely dog friendly and a good spot to watch some baseball. The beer selection was great and our waitress, Megan, was awesome, bringing us several samples to try. The food options were also wonderful – what is not to love when they serve homemade potato chips covered with nacho goodness!! We all wanted to know why we had never thought of that delicious combination before. 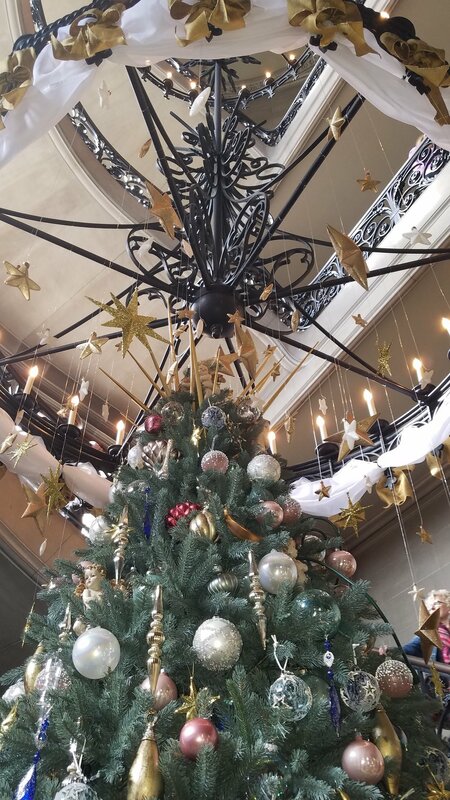 The next day was devoted to The Biltmore. We were pleasantly surprised when we got inside and realized they were decorating for Christmas and most of the trees were already up. The Biltmore did not move me in the way the Grove Park Inn did, maybe because it is such a blatant flaunting of wealth, but it was interesting to take a peek at what great wealth could do in its day. I think I was most impressed with the indoor pool! The dressing rooms were impressive, no one could possibly walk through the house in their bathing suits so there were numerous dressing rooms for men and women leading into the pool area. The pool itself was deep enough to have a diving board and was the original zero entry style pool. It was fitted with a HOT WATER to heat, and since there were no chemicals for pools back then, it had to be drained every 3 days and completely cleaned, then refilled and heated. Obviously that wasn’t a problem for the guests, but the upkeep had to be enormous. 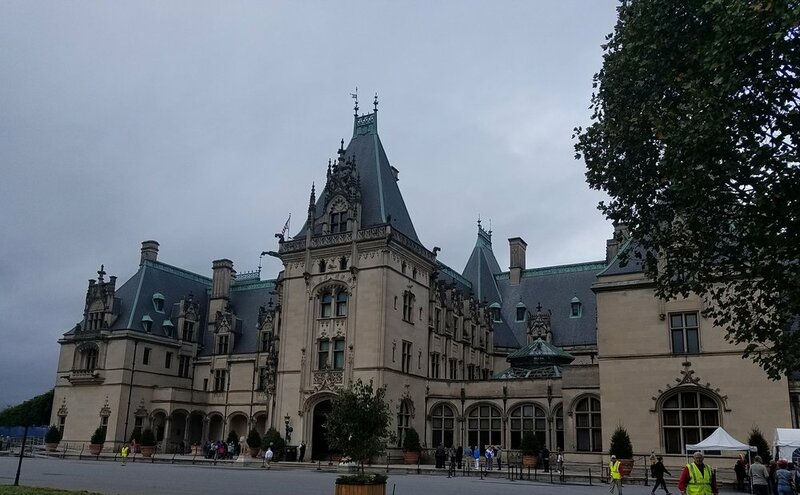 This is the Biltmore House, built by Charles Vanderbilt in the 1890s just south of downtown Asheville. It is the largest private home in the US. It has 102 bedrooms, 53 bathrooms and - GET THIS - 74 exterior doors. 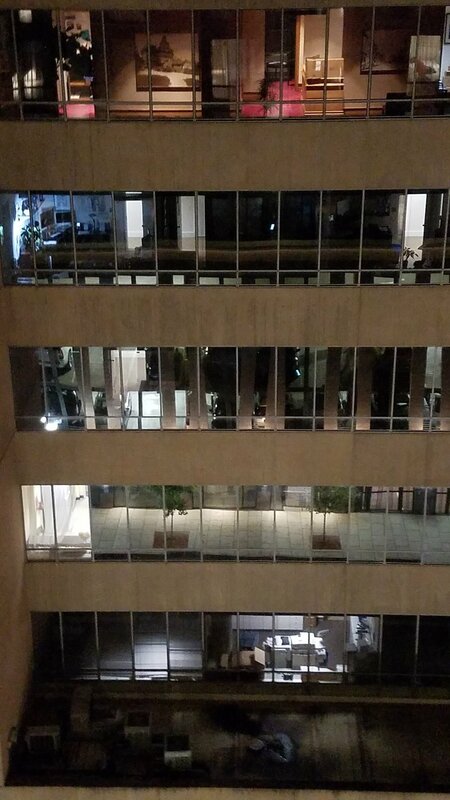 Imagine if your nightly routine included locking all those doors! We didn’t have time to spend in the gardens, but a quick look convinced us it would be worth another trip. The winery beckoned us and off we went. We stopped for lunch at the pub near the winery and it was one of the best lunches we could remember. The Bloody Mary was not as impressive as the train station, but the potato soup with bacon and chives and the Rueben sandwich were incredible. Mike and I opted to split these two items and I always appreciate it when the splitting is done in kitchen. I think it is a nice touch! Before we headed to the winery we wanted to walk off lunch so we went to visit the farm area. While we were there the blacksmith was fixing the grounds-keeper’s rake, just like would have been done a century ago here. That was interesting to watch. Then on to the petting area to meet the baby pigs. They had 3 babies being bottle fed because they lost the mom during birthing. In addition, there were baby cows, sheep and goats. On to the winery. We were all pleasantly surprised by some of the wines we tasted. They have an extensive list and you are allowed to pick a half a dozen to sample. One last stop before we left and that was The Creamery. I am a sucker for a really good scoop of ice cream and the The Creamery did not disappoint! 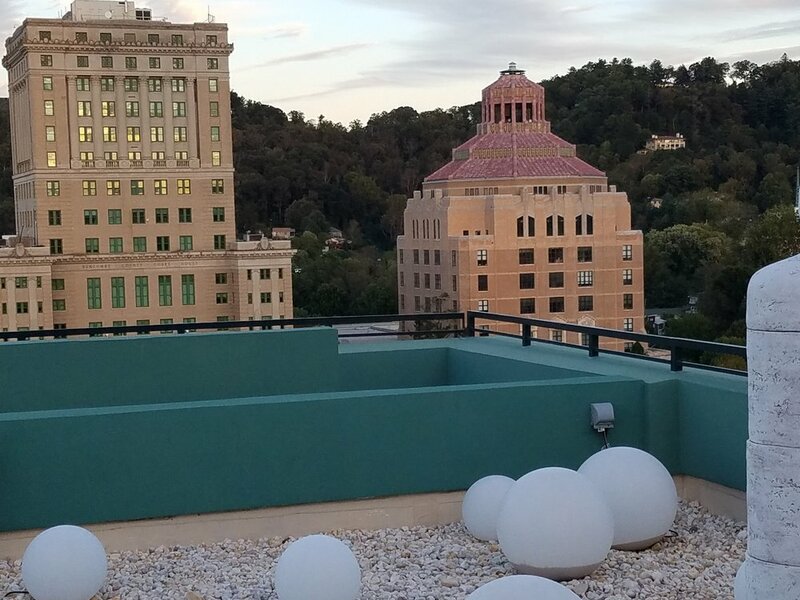 We spent our last night in Asheville at the Marriott’s rooftop bar called Cappella on 9. 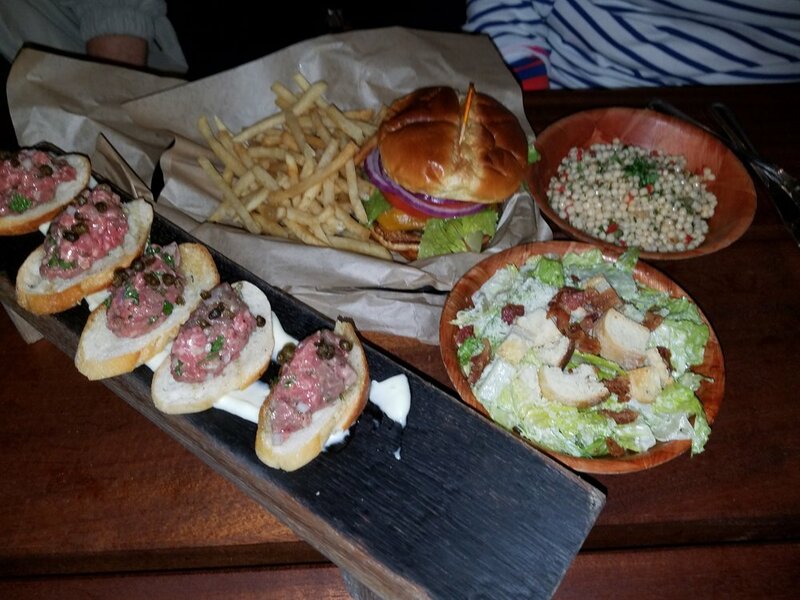 We went for the sunset but stayed for the small plates and atmosphere. This is a lovely rooftop location with great heaters and gas firepits. Our waitress, Victoria, was wonderful. We welcomed sunset with a cocktail, I had a wonderful martini, and washed down our cheese, charcuterie and roasted brussel sprouts with a nice glass of pinot grigio. When you visit don’t miss the 3D artwork in the hallway, they have glasses available for you to get the full effect. I would put this spot on everyone’s go to list! Heading home we stopped for lunch in Newberry, SC, home to, of all things, an Opera House. A quaint town with a great little restaurant in what used to be the pharmacy. It was a good choice to break up our ride home.